If you know me, then this may not come as much of a surprise, but if you're new here, well, I have a confession to make: I go to IKEA at least once a week (sometimes twice!). Is it a bit obsessive? Yeah, quite possibly. But in my defense, almost every single time I check out IKEA I manage to find a new gem that I either take home that day or make note of for future purchase. Now, I'm by no means claiming that these IKEA gems are of the highest quality, no; but I don't really think "high quality" is the first thing that comes to anyone's mind when they think of IKEA. But what IKEA lacks in luxury it most certainly makes up for in functional design and affordability. Clean lines, muted colors, and (cheap) sustainable materials lay the foundation for most of IKEA's merchandise, leaving quite a bit of room (and the necessary funds) for fun and creativity. Now, IKEA can definitely be hit or miss; as much as I love the place, some seasons are definitely better than others. And these past few months, well I think they've been just fabulous. From their recent collaboration with HAY (from Denmark) to what the "PS" and "Stockholm" lines at IKEA have been putting out, there's been a lot of great inventory to work with lately. So I figured now would be as a great a time as any to put together a list of pieces that caught my eye; from throws to sofas to decorative objects, these pieces are versatile, functional, and all sorts of perfect, especially for the colder months. So, if you're like me and have been wanting to spruce up your space while maintaining a fairly tight budget, then check out some of my picks below! With its classic herringbone design and detailed edging, this wool throw is definitely a far more luxe and durable throw than I'm used to seeing at IKEA. It's a bit pricier than your typical IKEA throw (usually around $10-$25), but I'd say it's worth it for the quality you'll be getting with this piece. Soft to the touch, incredibly cozy, and neutral in color, the Strimlönn throw is the perfect addition to any home, especially if you're all about achieving that Danish concept of "hygge." So a bit of background regarding the "PS" line - IKEA first launched PS (which stands for Post Scriptum) in 1995 and they have since been putting out new collections about every three years. The PS collections focus on cutting edge or forward-thinking Scandinavian furniture design without losing sight of affordability. This armchair from the PS 2012 collection, for example, would make the perfect sculptural addition as either an accent chair in the living room or at either end of a dining table, and it will set you back less than $100 a piece. Oh, and this one requires very very minimal assembly! Always a plus when it comes to IKEA. The LISABO series has always been one of my favorites from IKEA. The pieces in this collection are super durable and incredibly easy to assemble, and they add a beautiful touch of nature and lightness to any room thanks to their typically ash veneer finish. 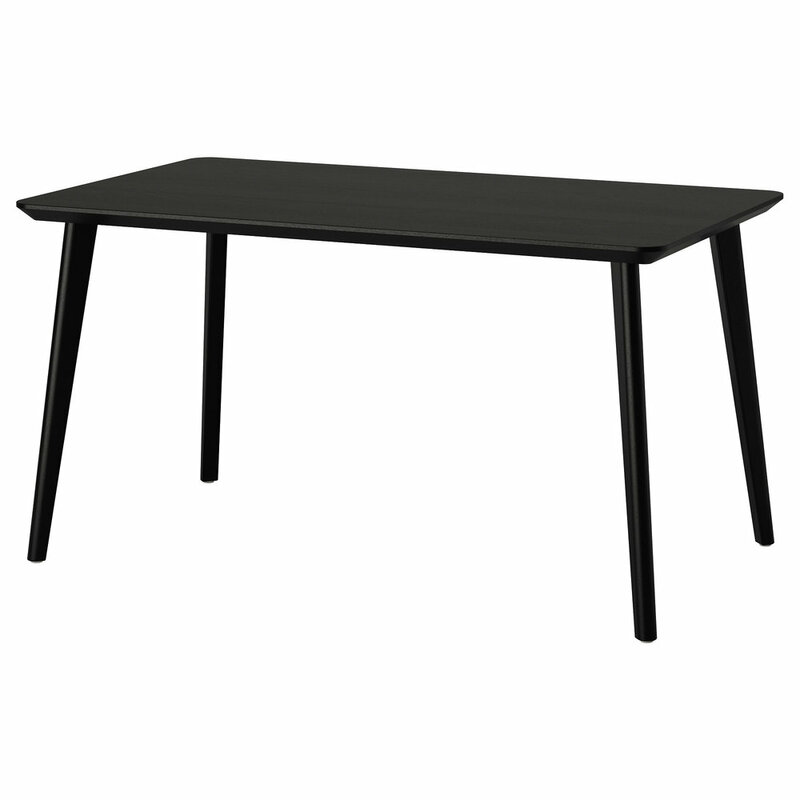 This dining table, however, is new to the LISABO family, and I believe the only black piece in the collection. Due to the hand-crafted and light design of the table, however, the black doesn't come off as being too heavy at all. This is on my "to purchase" list because I think the black adds a beautiful, unique and somewhat dramatic twist to an otherwise simple or traditional dining table. Rugs can get pretty expensive quick. I'm honestly not too crazy about IKEA's rug selection, but I've been very into the natural, flatwoven look lately. IKEA's LOHALS rug is exactly that. It's made of jute, which is both durable and recyclable, and it's rather affordable with the largest sized rug coming in at $139. I also consider this rug an IKEA gem because it's a style that can be used just about anywhere in one's space, from the living room or entryway to under a dining table or in the kitchen. Again, I may be a bit biased since 've been looking for this style of rug for a while now, but if you're into the same light and natural look as I am, this is a great rug to have around! I had been eyeing this exact sofa for months, and then I went to Oslo and had to sleep on it for a week straight while I was staying with my friend, Malene. I'm excited to report that it's just as comfortable as it is chic and streamlined! The seats are quite wide, low and deep, so it's both modern looking and inviting, especially if you want to curl up with a good book and a cup of tea or coffee. The armrests are also optional since there are different styles and pieces in the Söderhamn family that can be combined and attached together. I actually find that this smaller sofa, when on its own, appears a lot larger without the armrests! Oh and it also comes in a few colors - this charcoal or black option, an off-white, blush pink (their version of "Millennial Pink," perhaps?) and a greenish turquoise. You can never have too much "alternative" storage space, especially if you have a lot of stuff but not a lot of space. I tend to gravitate towards baskets like this seagrass and black option from IKEA, especially when I'm looking for something to house my extra throws and decorative pillows. It's a nice way to store items you don't necessarily need to use every day, but that you still want to use or show off as part of your decor. This piece is designed to be both functional and decorative; how you end up using it is totally up to you! If you, like me, are a fan of clothing racks in general, this is a really chic, sturdy and affordable option. I've been a fan of clothing racks for quite some time now, likely since I first moved to New York in 2010 (for college). Having to exist in cramped quarters for years on end, you quickly become rather appreciative of items that provide any extra storage, like this rack. 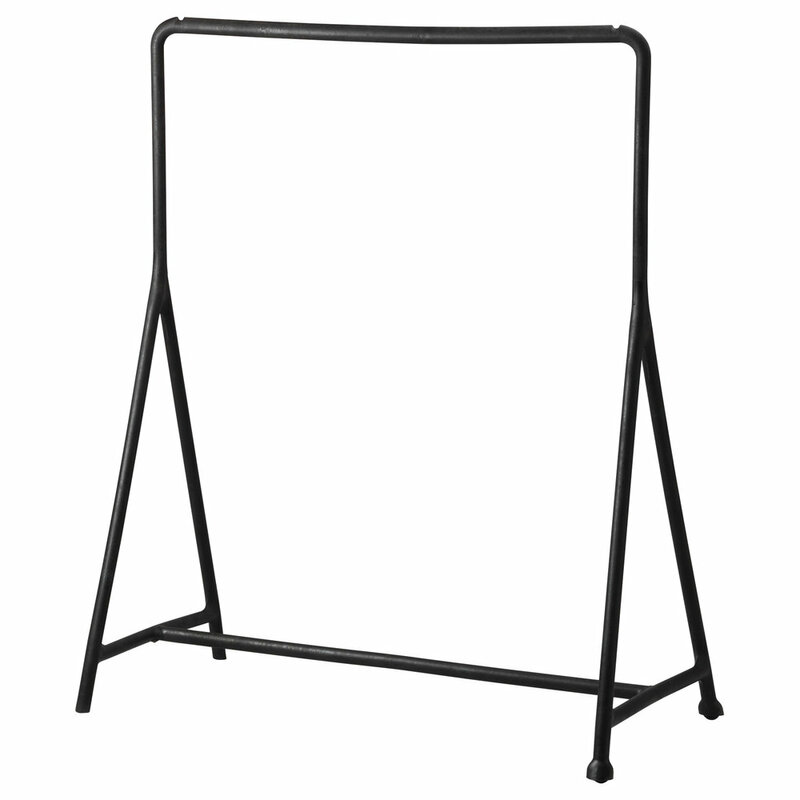 The black color adds a nice modern touch and since it was designed to be used either indoors or outdoors, you know the TURBO is going to be sturdier than our average cheap plastic clothing rack. I like to use my rack for my "seasonal favorites," so it's currently home to my favorite sweaters, leather jackets, and booties. I've been seeing and using cowhides in various interiors a lot lately and while they're typically quite expensive, IKEA makes a lovely, inexpensive version called the KOLDBY rug. It comes in a variety of colors and variations, but I'm a huge fan of the solid black version. I'd likely use one of these as an accent rug under a wooden dining table. Another true must-have in my book are these matte black candlestick holders in varying heights. They come in sets of 3 and cost just under $10, so you get a pretty solid bang for your buck. I've probably purchased 2 or 3 FULLTALIG sets already because you can use these in so many different places and variations throughout your home. You can use a set (or two) as part of your dining table setting or place them on a mantle or shelf unit, if you have one. Candles can easily create a rather intimate setting, and they're paramount to achieving that "hygge" concept I mentioned earlier. The ODGER chair caught my eye primarily due to its shape and texture. It's new to IKEA, has a bowl-shaped seat with a curved or rounded back, and comes in this white beige color, a chocolate brown, and a charcoal/black. It's also apparently made of renewable wood and recycled plastic, which explains how unique it feels. It's sturdy and solid to the touch, but feels light and airy when you pick it up. It's a rather unique and interesting piece, especially for IKEA, so I had to put it on the list. I've always been a fan of this SINNERLIG pendant lamp so it had to be put on this list! Despite it's larger size, it's light and airy courtesy of the bamboo lattice work. The woven material creates a very warm and welcoming space, and it even creates beautiful light patterns throughout the room. Pendant lights are a really great lighting option if you live in a smaller space, particularly because they do their intended job without taking up any floor space. This lamp, though, does all that AND packs a great punch in the design department. This vase was introduced this year with IKEA's holiday collection (hence the name "VINTER 2017 Vase"). It's on my list because it's actually both a vase and a tea light candle holder, so it can be used in a variety of ways. I actually own this already and I used the tea light holder part on a table with a few other types of candles and coiled string lights inside the vase, ultimately creating a DIY light source when they're plugged in. You could also use the vase to house an artificial plant or leaf and leave the black top on with a lit tea light. You can do a lot with this piece and I love that you're actually getting two individual items for only $10. They also have a smaller version and larger version of this item so you can pick the best fit for your space and intentions. 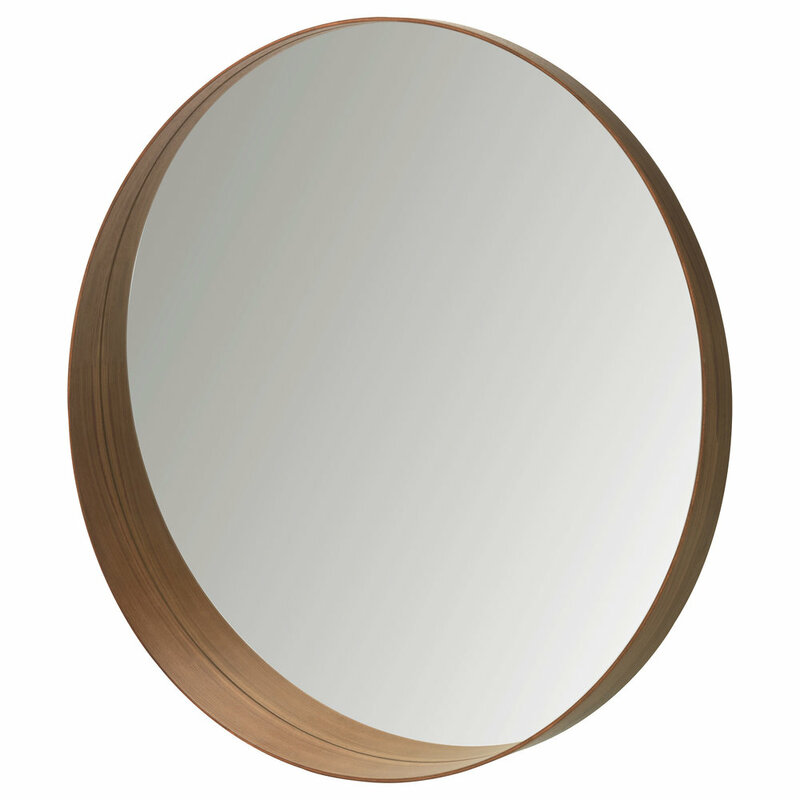 I adore this mirror, primarily due to the walnut veneer lining the inside, and the round shape. It looks great as part of a gallery wall or as an entryway mirror, and it's one of IKEA's higher quality mirrors (hence the slightly higher than usual price point). At $4.99 for a set of 3, the RAGGISAR basket set is seriously a lifesaver. I buy a ton of these and use them for just about everything that I can't or don't hang up in my closet, from socks and underwear to workout clothing and folded t-shirts. These baskets are made of grey felt so they're really malleable and soft, which means you can stuff a lot of stuff into them! And they're actually rather pretty so you can always put them on display, like on a console table, instead of hiding them in cabinets. Much like candles and candle holders, you can also never have too many glass cylindrical vases! I buy a few sets of these at a time, not necessarily to use them all at once, but as backups in case I break any, hehe. 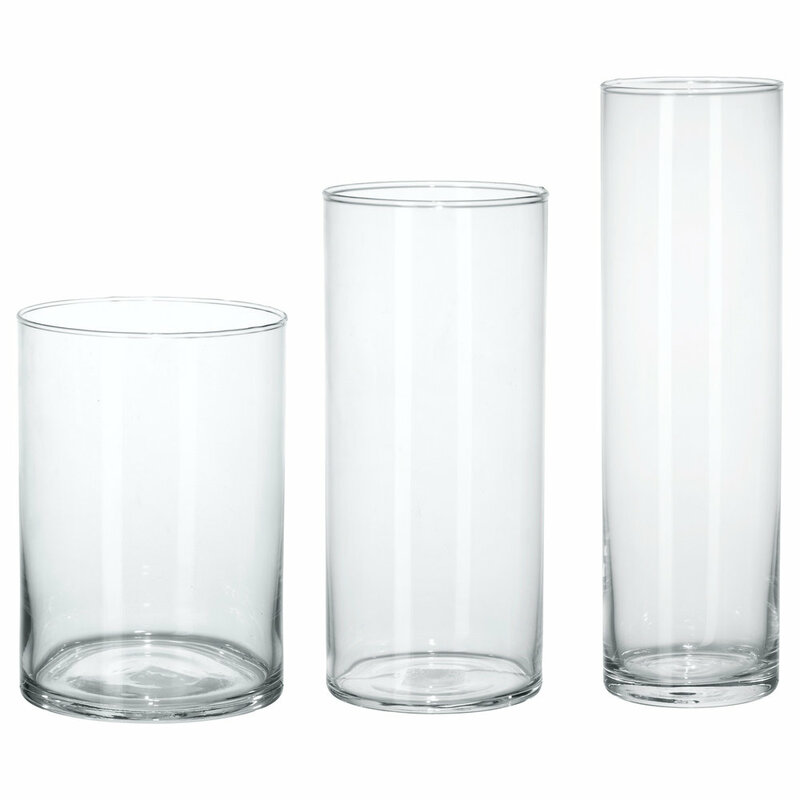 IKEA's vase sets usually come in three different sizes (again, much like their candlestick holder set) so you can easily use them together or broken up throughout your space. I like to use the shorter, wider vase as a block candle holder and the longer, thinner ones for long stemmed flowers. At the end of the day, they're glass cylinders so you can use them for just about anything you can think of!